Below average set up time 15 minutes set up and pack up. Time improved with practice. As this tent is using some out of the box thinking one can assume that it will also require out of the box design and cost. As is the case with this Incredible couples camping tents. The Limitless accessibility this tent gives you be amazing, however a luxury and a price to match. The Tensile Stingray 3-Person Camping Tent costs far more than the average 3 person camping tents. 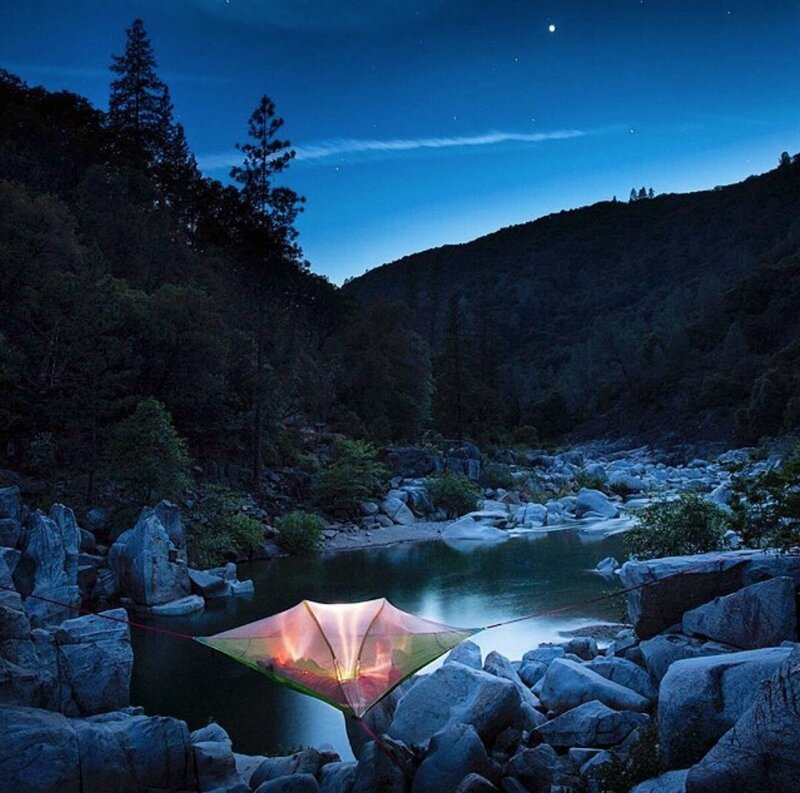 Although it will provide you with speechless views and a wonderful sense of adventure, the tent didn’t score full points in the section due to cost more than $100 per sleeping space. Most camping tents of average to well-made quality should never cost more than $100 per sleeping space as it simply isn’t justified. However, to be fair, this is a specialized design of tent and you will be at the envy of your friends as you look down upon them. Though the tent material isn’t anything special in contrast to regular camping tents it is of a high quality and strength, secondly the tent is somewhat minimalist with features. With most of its manufacturing costs begin invested in stability, strength and safety. How this tent works is somewhat simple but you will begin to understand and be grateful such expensive strong materials were used in its design. As mentioned earlier this tent is made of high quality material, as it should be considering you will be camping above ground. A tent like this need to be strong enough to support both you and your belongings or you’ll end up with a rather sore bottom. It is Important that because of these coatings the tent comes with the following warning for Residents of California. Holding everything above the ground safely attached to nearby trees is the tents ratchets and straps 3 x Straps 19′ / 6m straps and heavy-duty ratchets buckles- 2.5 ton minimum breaking strength. Though this tents materials are strong and of good quality it is worth highlighting that because the tent is made of polyester it is not advised to keep the tent exposed to excessive sun over long duration of time. As with all polyester tens irrelevant of UV protection they can eventually begin to sag, fade and wear down. Simply set up your tent in pertly shaded areas. Considering this tent is usually suspended in trees, ensuring a partly shading set up shouldn’t be too difficult. Polyester is also a poor insular and ventilator. However, to overcome these issues the design of this tent has plenty of ventilation. A positive to polyester is that is more tear resistant and less likely to develop mold in contrast to nylon. Secondly is also a great light weight material ensuring a lighter travel package and increasing manovrability. Whilst it appears the tent is light on the features side it is very generous with its Durability. The base and straps of the tent is capable of withstanding a maximum weight load of 400kg / 880lbs. That’s plenty of weight for two people and their belongings. Both of the poles are 8.5mm diameter anodized aluminum alloy 7001 T6 rating. These poles are both flexible and strong. Keeping all of this material ad weight secure way up in the tress is the tents ratchets and straps. The 3 straps are 19′ / 6m in dimension and are supported by the tents heavy-duty ratchet buckles bosting a breaking strength of 2.5 tons. All of this combined equals a very strong durable and secure set up for safe suspension. The tents material is strong tear resistant polyester which is all held together with durable sewing methods. The tents seams are double sewn lap-felled seams which are excellent for camping tents as it provides the extra strength required for stretching and pulling that may accur during stormy weather via rain and wind. The entry points feature strong nylon coiled zippers which are also provided with zipper flaps to ensure your zips are protected from dirt and moisture allowing for a confident and consistent zipping action when required. Should you wish to protect your trapdoors zippers further there is an after purchase option to buy a trapdoor cover. The Tensile Stingray 3-Person Camping Tent is both sizable and spacious for a camping couple. 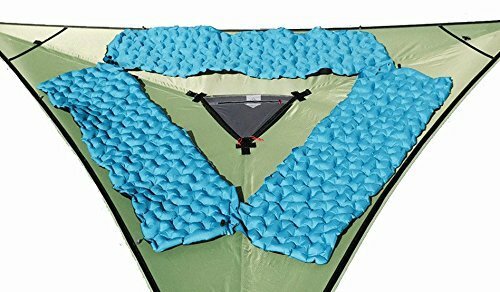 Though the tent does specify it is designed for three people, this only refers to the number of sleeping bag which can fit inside. For a more spacious experience I would suggest it is more appropriate for a couple. The tents dimension suggest enough room for either two separate sleeping bags or a double with plenty of room storage. Depending on if you plan to use the floor hatch or not it would be wise to use a set up that doesn’t cover the exit. In terms of manovrabilty this tent is average. With a total weight of 10kg/ 22lbs (once experienced, you can save up to 940g / 2lbs by dropping 2 ratchets from your system and adding weblocks) and a pack down size of 55 x 24 x 24cm / 21.6 x 9.4 x 9.4in it isn’t as tractable as one would desire to achieve reaching the unreachable areas to set up this awesome tents. That begin said it is not a tent for one person who is hiking. In the context of a camping couple it would be wise for one individual to carry this tent whist your partner carries the other gear. This will allow a safer more practible method of transport for you and allow for the hard to reach areas to be more practible and achievable. Surprisingly this tent comes with a 4 seasons rating. This essentially means that the tent can withstand all types of weather and temperatures all year round. However, it is not designed for winter temperatures you might find in the arctic circle. Though the tent is 4 seasons rated, customers have suggested purchasing an aftermarket insulated floor mat as the tent can be a bit breezy or cold through the floor. As one can imagine all of your bodies heat would leave via the floor and not offer much in terms of insulation. 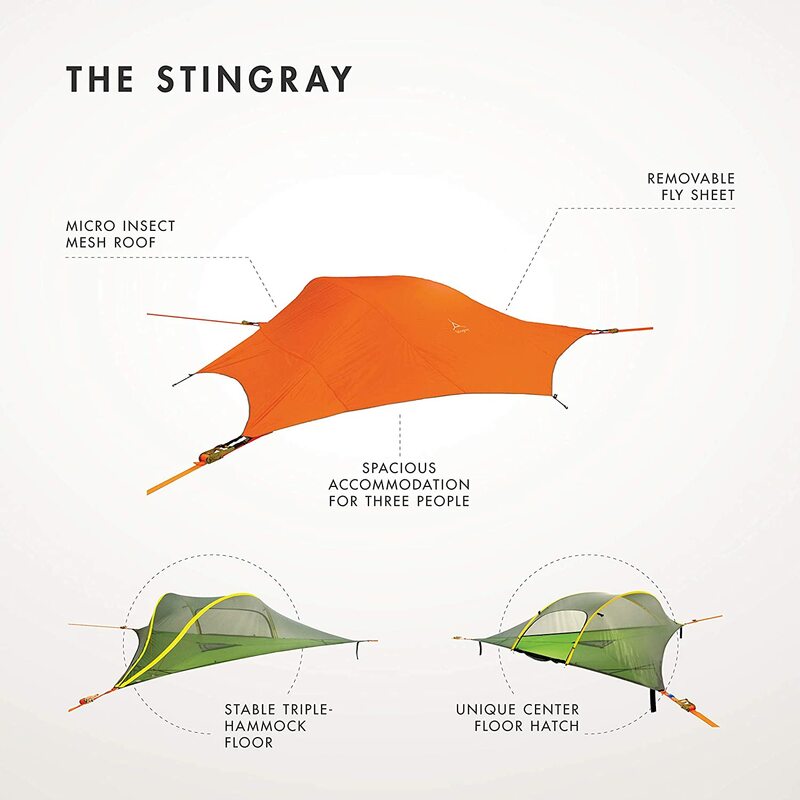 The Tensile Stingray 3-Person Camping Tent is very wind resistant. Its smooth dome like design in combination with its three point high tension stability system and heavy-duty tent poles ensure that the tent isn’t going anywhere. The only thing you need to worry about is ensuring you attach yourself to appropriately strong trees. Dome shaped tents assist with wind resistance by allowing the wind to roll over the tent more easily as its smooth round shapes creates less resistance for the wind in contrast to a flat wall. 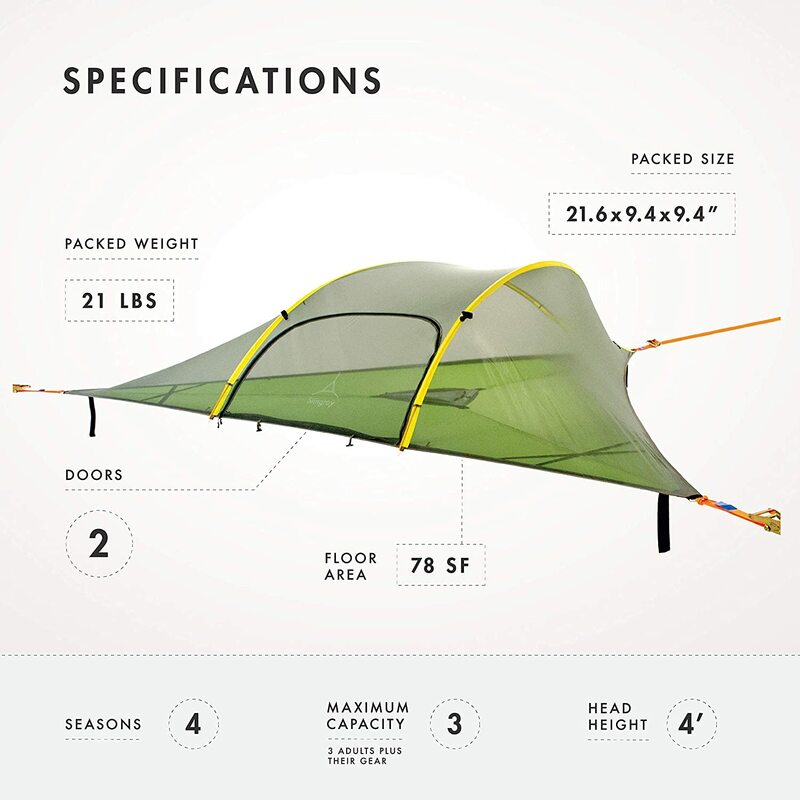 As the tent is secured in three locations under tension, the tent is secured in all directions from the wind and will not sway, unlike a traditional two point hammocks. The score for water resistance for this tent was rather high. This is due to a combination of the tent begin a high quality polyester. Polyester has natural water resistant abilities in comparison to canvas. Secondly the material has a water resistant PU coating added. This coating bosts a Hydrostatic Head of 3000mm. This measurement is used to determine at which level of water weight the tents material will begin to seem water inside. A PU of this level is generously high and will guarantee a waterproof experience in bad weather. It is worth noting that I did not see an specification whether the seams of the tent have been sealed or not. Was a general rule and good practice, it is always recommended ensuring an extra level of water protection by purchasing an aftermarket seam sealant to sure no leeks through the seams. This product comes with a product warrant (Their Warranty). this tent is not an expensive high performing tents. Set-up time for this tent is below average in comparison to other tents. However, it is worth highlighting that this is not a standard conventional tents. It would be unfair to make comparisons of this tents setup time to other standard tents. This tent is somewhat specialized and offers a whole new way of camping and having adventures. That begin said, the tent takes an average of 15 minutes to set up and pack up. As with most tents this time can be improved with practice. This would be the first tent I have done a review on that didn’t score full points for its price. Though it is slightly expensive, the tents durability, quality of material, wind and water resistance all add up in manufacturing costs. The product is well worth its cost in value as it will certainly provide an awesome camping experience. The tents dimensions are generous with enough room for 2 and luggage and comes with a cool trap door exit as well as a standard front door. Pest and insects will not bother you far up in the tress as the tent is enclosed with very fine nylon mesh designed to keep all the unwanted pests outside of your tents. I would personally only purchase this tent if you are looking for something new and fun in camping. If you are a beginner camper I would stick to normal tents for now. As mentioned earlier my favorite feature of this tent is that the company plants trees for each sale of tents. Helping plant forest is amazing and will allow our future generations to enjoy what we are all enjoying today.